With spring finally here and summer coming quickly you may be thinking about the best places in Europe to head to for your next family holiday abroad. Whether you’re travelling with children, younger or older, or it’s just you and your special somebody, everyone always loves a bit of the Mediterranean. From the Greek islands to the smaller ones like Corsica or Elba, the choices abound when you’re looking for a sandy shore to call your own. Elba island is an island part of the country of Italy, off its west coast. It’s a smaller island that is sandwiched between Corsica and mainland Italy, making it an ideal place to base yourself to get the best of both worlds. 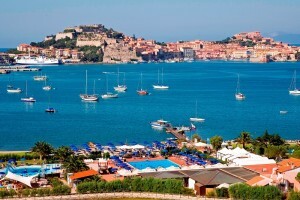 Daily ferries to and from Elba mean that you can check out the nearby islands of Corsica and others. Elba is brimming with excitement and things to see and do, so any trip to the island is sure to be exciting for all travelling companions and family members. For history buffs you have the fantastic homes of Napoleon that he lived in when he had been exiled to the island – both are now museums that can be visited by those keen historians. For those who like sea life and aquatic creatures, you won’t want to miss the Elba Aquarium and Wildlife Museum – a unique opportunity to get up close and personal to some of the great aquatic species that make the region their home (and further afield!). Located near Marina di Campo. A few miles from Marina di Campo is Fetovaia Beach – an idyllic setting for travellers of all ages from 8 to 80 and beyond. Crystal clear waters and great trails in the region make this the perfect place to get away from it all and while away the hours on the sand or in the water. Don’t forget to check out the lookout point for some truly commanding views. There are a number of other beaches spread throughout the island, such as Pomonte Beach on the west side of the island. For those who like a bit of diving and snorkelling Pomonte Beach is perfect as it even features an old shipwreck that makes the perfect diving spot. The beach is ideal for families and generally all travellers looking to enjoy a beach day in the sun. If you like stunning views and a bit of hiking, the Fortress of Volterraio is probably the place for you. Set atop a high hill accessible from some hiking paths, this will take you back in time to old world Elba. Spend an afternoon hiking through the forests surrounding it and enjoying the natural world of the island and check out the fortress for a step back in time. In terms of higher places on the island with great views, Capanne Mount is one of the best. Featuring accessibility by cable car as well as hiking trails the view from the top is unbeatable and is one of the best on the island. Check out three full sides of Elba from the top and get back to nature by hiking your way up – simply the most ideal way to spend part of a day! There you have a couple of reasons why Elba is the best place to head for those looking to get away from it all and have a bit of fun in the sun with great options for activities like those highlighted here, which can be viewed in this great article that we got some inspiration from, along with the infographic below to help you plan your trip to Elba. Spend the days wandering some of the islands towns and cities, swimming or lazing on the beach – anything goes on the island of Elba.